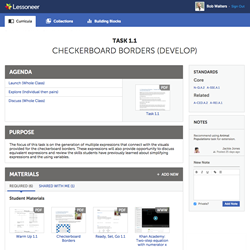 Lessoneer provides everything a teacher needs to facilitate student learning with MVP. EdCaliber, creator of Lessoneer, the first Teacher Empowerment Platform for K-12 school districts, and Mathematics Vision Project (MVP), today announced the availability of the complete MVP Open Educational Resource (OER) Math curriculum and the MVP Teacher Support Ancillaries within the Lessoneer platform, at no additional charge to Lessoneer customer school districts. School districts across the country have discovered that they can realize the vision of the Common Core State Standards using the MVP curriculum, while avoiding the license fees charged by traditional publishers. Starting today, Lessoneer provides anytime anywhere access to the MVP curriculum and all of the support materials teachers need on a daily basis, eliminating the need for expensive printing. Districts can use the money they save on license fees and printing for professional development, to support teachers in improving classroom instruction. Visitors to https://lessoneer.com will discover how integrating curriculum and standards-aligned resources into a centralized, easy-to-use platform can streamline the planning process, addressing one of today’s most pressing issues: the lack of teacher time. For more information about Mathematics Vision Project curriculum and professional development, visit http://www.mathematicsvisionproject.org. MVP is an educator-driven initiative that provides first-rate mathematics curriculum for grades nine through twelve, built from the ground up to support Common Core. The MVP authors provide rich and engaging professional development for the improvement of classroom instruction. The MVP curriculum is free and published under a Creative Commons license.